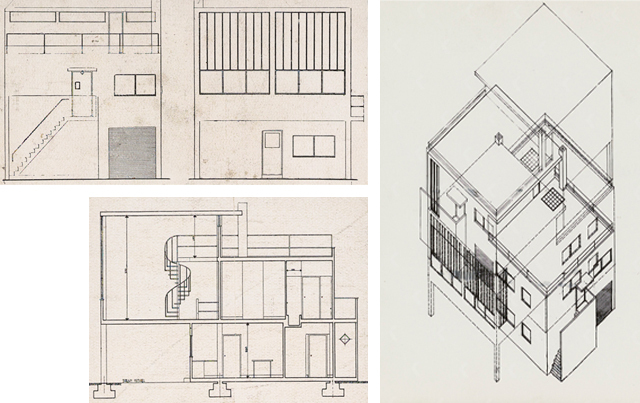 The origins of the Van Doesburg studio-house can be traced back to 1926. Theo and Nelly purchased a plot of land with Hans Arp and his wife Sophie Taeber-Arp in Clamart, a small town south west of Paris. At that stage Van Doesburg was working with the Arps on the design of an interior of the Aubette entertainment facility in Strasbourg. The two couples got along well; the plot they bought was big enough for a double studio-house, for which Van Doesburg made the design. Since he was not an experienced architect he asked the Swiss architect Denis Honegger to make the construction drawings. However, Van Doesburg felt that Honegger was acting more as a designer than a draughtsman, making matters unnecessarily complicated. The design process was delayed and the Arps were concerned that building costs would go up. They abandoned the plans for a joint house and took over part of the land from the Van Doesburgs. 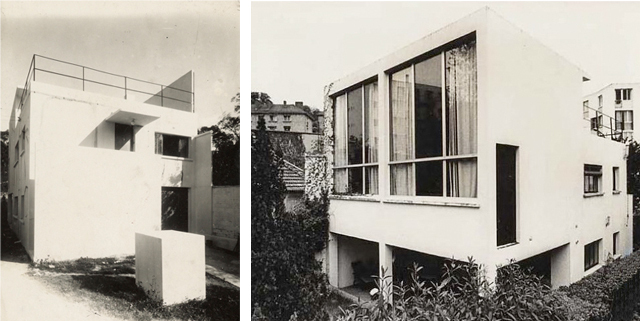 That did not mean Van Doesburg had abandoned his ambition to build a studio-house: in 1927 Theo and Nelly bought a narrow plot in a sloping street – Rue Charles Infroit – near the station at Meudon-Val-Fleury. Front, back and side face and axonometry, situation 1929 (with the not executed spiral staircase). This time Van Doesburg was assisted by the young Dutch architecture student Abraham Elzas. With respect to his role in the collaboration, Elzas said he was ‘Van Doesburg’s pencil’. The design arose from the plans for the double dwelling with the Arps, but the plot was much smaller. Van Doesburg designed everything, including the doors, staircases, windows, frames, the colours of the floor and the stained glass window. The result is a clear concept of two interlocking cubes, one for the studio, the other for the living accommodation. The front façade, which is part of the ‘residential cube’, consists of horizontal and vertical planes. The diagonal staircase to the first floor is hidden behind a square wall, which is further accentuated with a canopy above the door. The use of colour in the white-rendered façade is limited to the external doors, in red, yellow and blue. At the front, the parapet on the roof enclosing the terrace is visible. The rear elevation is part of the ‘studio cube’. It leans over a terrace with a garden beyond and is dominated by two wide windows, several metres in height, with black steel frames. 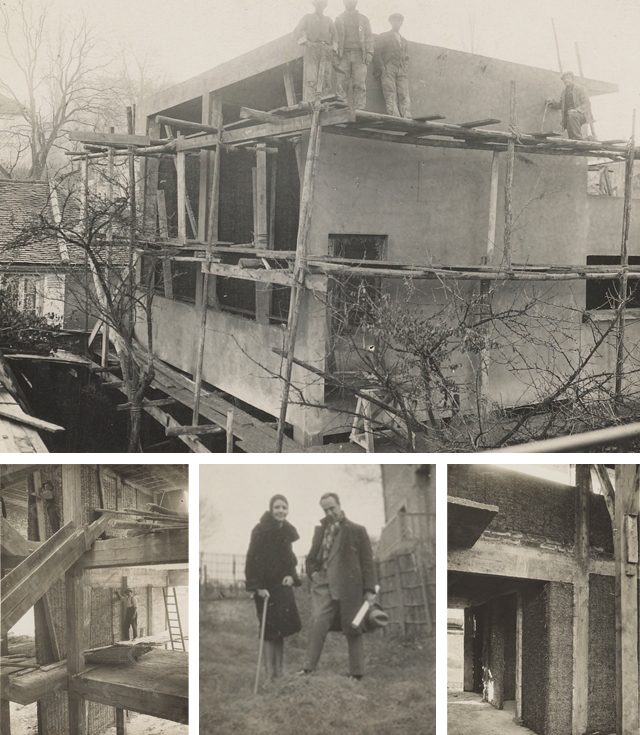 The studio-house under construction and Nelly and Theo at the building site, 1930. The building of the studio-house was an ongoing source of problems because Van Doesburg applied no standard measurements whatsoever. In addition, he was experimenting with materials, including Solomite, a product name for compressed straw panels used to fill the concrete frame. They were then finished with a coat of stucco and cement plaster. Van Doesburg probably chose that relatively cheap material to save money. Even during construction the cement coat of the Solomite had started to crack; according to Van Doesburg because of differences in temperature that the material could not accommodate. The company paid for the cracks to be remedied. The roofterrace and the covered terrace with the entrance to the kitchen, 1930s. Some colleagues were disappointed that the two cubes were simply slid together and lacked the fanning-out effect of earlier designs. However, the design’s simplicity may also have been a deliberate choice, as Evert van Straaten and architect and colour expert, Mariël Polman, suggest in their study. Van Straaten is of the opinion that the studio-house reflects Van Doesburg’s changing views on composition, in that he expanded the strict horizontal and vertical lineation (neo-Plasticism), as prescribed by Piet Mondrian, with Elementarism, with the dynamic diagonal as an essential element. From 1925 Van Doesburg was exhibiting an increasingly pronounced aversion to intuitive composition. Also, he was looking for a universal art, which was to be based on mathematics. Accordingly, in the latter years of his life, Van Doesburg applied parameters, constructing a universal form in which controllability was the watchword. That controllability is evident in the dimensions of the studio-house: Van Straaten concludes from drawings that Van Doesburg wanted to apply the Golden Section, but in the end he gave the studio-house a different dimensional system. Van Straaten believes that marks in many respects the transition from an intuitive to a more rational approach in Van Doesburg’s work. 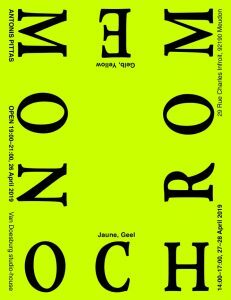 Apart from the indisputable rationalizations in Van Doesburg’s thinking, the practical limitations – including the narrow site – were undoubtedly also of significance.